The 1.7.0_51 update of Java has introduced some changes that I thought would be worth addressing. Recently, you may have heard about security concerns surrounding Java. Since BikeCAD is written in Java, I feel compelled to emphasize that these security concerns are limited to the Java plugin for browsers. Despite this concern, Java is still a thriving language: still ranked #2 in the January 2014 TIOBE Programming Community index which is an indicator of the popularity of programming languages world-wide. While the Java language is thriving, the use of the Java plugin for web browsers is waning. BikeCAD Pro runs as a standalone Java application and is therefore free of any security concerns. The free version of BikeCAD has always been implemented as a Java applet. Because it used to be a given that everyone would have the Java plugin installed in their browser, deploying BikeCAD as an applet was a convenient way to let people try some of the features of BikeCAD Pro without any special downloads. There are two main types of Java applets. Java applets can be signed or unsigned. Signed applets have the ability to read and write files both on the web server where they are stored, plus on the local computer on which they are being deployed. Years ago, the free version of BikeCAD was distributed as a signed applet so that users could save and open designs from their own machines. However, under these circumstances, users were confronted with a warning message alerting them to the fact that the applet had this ability to read and write files, and that if the user did not trust the originator of the applet, that they should not proceed. Although I never had any malicious intent, I knew that not everyone could be expected to know that for sure. To solve this problem, I redesigned the BikeCAD applet to work within the restrictions of an unsigned applet. An unsigned applet has no ability to read or write files on the user's machine. An unsigned applet can only communicate back to the server on which it is stored. The redesigned version of BikeCAD would allow users to save and retrieve their designs but in order to do this, all files would be routed through the BikeCAD web server, and it was always the user controlling where these files were read from or written to on their own machine. As an unsigned applet, BikeCAD operates within a very strict security sandbox and therefore poses no security risks to the user. Still, because of the possibility of malicious software being deployed through the Java browser plugin, this latest version of Java (1.7.0_51) has default settings that will block the deployment of the BikeCAD applet as well. There are two ways to correct this. Both approaches involve opening the Java control panel. 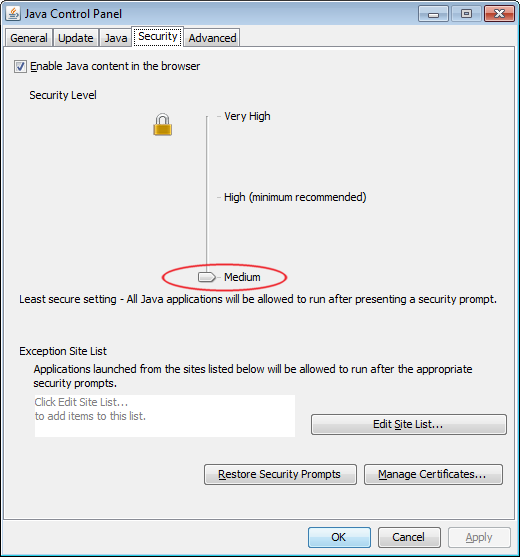 The first approach is to navigate to the security tab in the Java control panel and lower the security level to medium. This step alone will allow you to run BikeCAD in your browser. 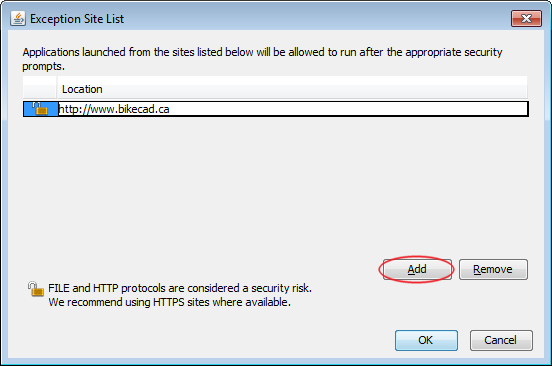 However, if you would like to maintain the recommended higher level of security, you can alternatively leave the security set to High, but click the "Edit Site List..." button and add http://www.bikecad.ca to the list of exceptions. If you need to upload BCAD files from your local computer, you will also need to allow http://bikecad.ca. This is the same as the first URL, but without the www. This is the dialog box you'll see when you click the "Edit Site List..." button. Following these instructions should get you back working on BikeCAD again. If any of this makes you feel uneasy, remember that BikeCAD Pro has no security concerns. For a one time fee of $350 (Canadian) you can have all the added functionality available within BikeCAD Pro. Java version 8, update 25, 1.8.0_25? Was using the second solution fine, then updated my Java from 1.7 to 1.8, went into Java options and added bikecad.ca to exception list, but the applet refuses to work any more. Am I overlooking something very simple, or is this not compatible with newest Java version? Would uninstalling v1.8, and installing v1.7 be my only answer, as I'd rather not? It's important that you ad both http://bikecad.ca and http://www.bikecad.ca to your exception site list. I have done this and have no trouble running the free version of BikeCAD on Java 1.8.0_25. Just tryed to startup free version and it's blocked under latest Safari and OS X. Using Java 8 Update 60, the latest as of today. I have your one exception in place and don't see the difference in the two you list. Also, only two security levels allowed now so I have it set to the lowest of the two. Thank you. It sounds like you're doing everything correctly. One thing to be aware of is that even though you may have Java downloaded and installed, it may not be enabled in your browser. There are instructions for enabling Java in various browsers at: java.com/en/download/help/enable_browser.xml. Of course, it's also worth trying another browser such as Firefox. On a related note, I am currently hard at work developing a new version of BikeCAD which will run in any browser without the need for a plugin. I'm happy with how things are coming together. However, I've still got a long way to go. If anyone else is struggling to get the current free version working, it's worth mentioning again that BikeCAD Pro is a standalone application and therefore is not subject to the restrictions that complicate your use of the free version. Tried all your suggestion and still cannot open bikecad on my mac. I'd like to buy the pro version but need to try the free first. Specifically, what happens when you attempt to run the free version? If you are using a 32 bit browser (Google Chrome prior to version 39 for example) you may find that Java simply won't run. If you've followed Brent's guidance above and run in Safari, it should work, but you should get confirmation dialogue boxes asking for your permission to run the Java applet. I've just loaded BikeCAD in both Safari Version 8.0 (10600.1.25.1) & Chrome Version 39.0.2171.71 (64-bit) having followed Brent's instructions. I slipped up first time around, I just entered 'www.bikecad.ca' as the site to add, I forgot the 'http://' prefix which was required. I'm sorry to hear you're having trouble. One thing that has thrown some people off is the following screen that will present itself in the Chrome browser. Many people seem to see this and not know how to get past it. The trick is to right click and choose Run this plug-in as shown below. 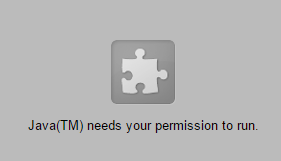 If this doesn't solve the problem, could you let me know the context in which you are being asked to give Java permission? I can't get on it! When you say Java crashes, what are you actually seeing? Sometimes, Chrome may warn that the plugin is unresponsive. It may give you the option to quit or wait. Waiting is often the solution. Another thing worth trying is another browser. BikeCAD is capable of running on IE, Firefox, Chrome, and Safari to name a few. If the screen is blank, that's not necessarily a bad thing. BikeCAD could just be loading. Maybe all you need to do is wait a bit longer. To get some more feedback on the progress of the loading process, you can turn on your Java console as described at: java.com/en/download/help/javaconsole.xml. If you continue to have trouble, please let me know how you get along running it on IE or Firefox. i have add both https://www.bikecad.ca and https://bikecad.ca to the exception list and still will not work. java sends an error message that the applet doesnt doesnt meet the security settings that i have set. i dont understand what is happening. running IE. You must enter the url as http:// not https://. I'm sorry to hear about this problem. I just updated Java on my own computer to 1.8.0_40-b26 as well and I did not encounter this issue. Does it provide any more info when you click the "Details" button? Have you tried a different browser? cache: Resource http://www.bikecad.ca/bikecad_loading_splash.gif has future expires: Fri May 08 21:07:39 CEST 2015 update check skipped. cache: Resource http://www.bikecad.ca/bikeCADPro.jar has future expires: Fri May 08 21:07:29 CEST 2015 update check skipped. basic: BikeCAD may take a few minutes to load. We appreciate your patience. cache: Resource http://www.bikecad.ca/properties.xml has future expires: Fri May 08 21:07:41 CEST 2015 update check skipped. cache: Resource http://www.bikecad.ca/fit_advisor.xml has future expires: Fri May 08 21:07:41 CEST 2015 update check skipped. cache: Resource http://www.bikecad.ca/componentProps.xml has future expires: Fri May 08 21:07:42 CEST 2015 update check skipped. network: Connecting http://www.bikecad.ca/crossdomain.xml with cookie "SESS3dc31dbf658a3dcd5c97c2d3cb42e317=PCVCX19dR-jq7Lyf9py2K9u62_03NcvHj_GeGeO2FEI; X-Mapping-nfchjghl=A8720B4E49D1CCF0E2702FB889B7F786; has_js=1"
I'm sorry you're having trouble running the applet. Thanks for sharing your Java console output. This is generally a very useful way to understand what might be going on. Unfortunately, nothing is leaping out at me. While this isn't necessarily the problem, a good chunk of the above output is concerned with the storage and retrieval of elements in the Java cache. 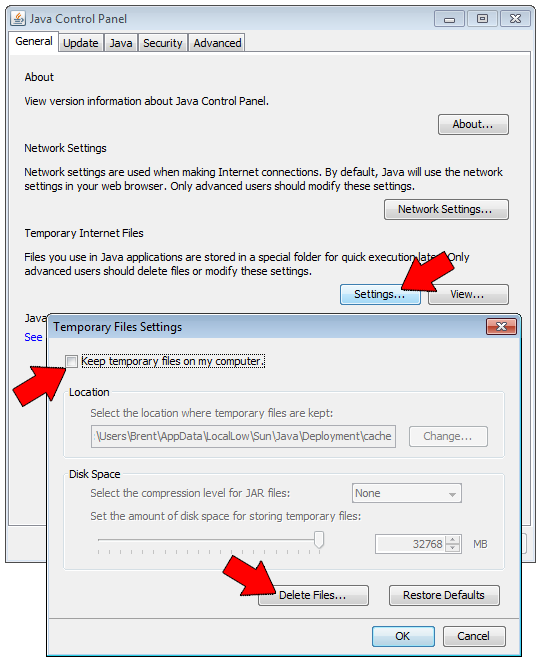 If you clear your Java cache and choose not to keep temporary files on your computer, the output you see in your console will be reduced significantly which may make it easier to isolate the actual problem. You can choose not to keep temporary files as shown below. You didn't mention what browser you were trying this on. It would also be worth trying another browser such as Internet Explorer, Firefox, Chrome or Safari. I did this on Internet Explorer. I've tried Firefox first. Does it mean that Java is simply not running? For the most part, the output you've pasted above is just the standard preamble that is presented each time the Java console is launched. The significant info in the first case is simply the character 0 which doesn't tell me much. In the second case, it's the line: INTERRUPTED while loading Image. I can only speculate on what caused the interruption. How reliable is your internet connection? Is there some antivirus software that might be interferring with things? My internet connection is very reliable. I lifted the firewall and bikecad didn't work either. I give up. If one looks at the number of visitors of this site not being able to access the program, maybe it is worth considering the programming itself in stead of pointing at the settings of the users' computers. I didn't mean any offence in asking about your Internet connection. I feel like I need to put the current state of the free BikeCAD applet in context. Years ago, Java applets were a great way to distribute useful tools online. 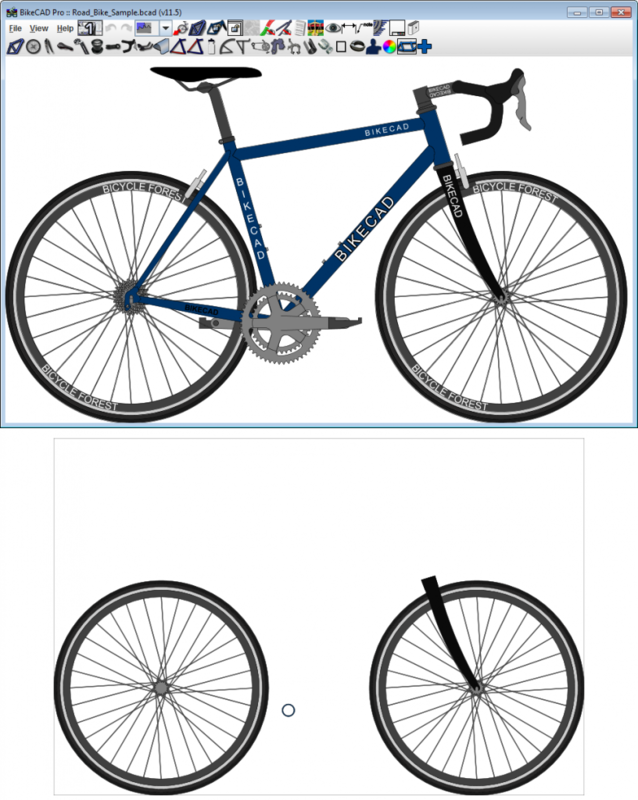 I developed the BikeCAD applet to help me design my own bikes and got a kick out of sharing it with other builders. Over the years, builders requested more features and the program has become more and more comprehensive as a result. For a few years now, thanks to the support of framebuilders, bike shops and fit specialists, I have managed to make a modest living through sales of the standalone application BikeCAD Pro. All the while, I've appreciated being able to share some of the functionality of BikeCAD Pro through the free BikeCAD applet. Back in the day, running a Java applet was a foolproof endeavour. Unfortunately, due to changes I can't control, Java applets are now so tightly restricted that in order to use the free BikeCAD applet, there are adjustments in settings that simply need to be made to a user's computer. I recognize that asking casual users to go to such lengths is not great. I also recognize that at the end of the day its up to me to solve this with programming at my end. However, it's not looking like that programming will be in the form of tweaks to the Java applet. It's going to mean a migration to a completely different platform. I'm currently working towards that and I hope you will give the free version of BikeCAD another shot when I have a new iteration ready to share. Brent, I am looking forward to give BikeCAD another shot. I live in one of the world's cycling meccas (Flanders) but I cannot find a custom frame builder who is willing to listen to my wishes because my wishes lay outside tradition. However, your tool will allow me to communicate with and source the world ... once I can use it. I will have my dream bike. In the mean time I proudly ride my Merckx. Jan. Same problems as above with both Chrome and MS Explorer. I don't get the "Run this Plugin" option. I only get "hide this plugin" and "inspect plugin" with Chrome. MS explorer I thought was going to work as I have the "loading" page. It only loaded a blank screen though (a few times). I left it for 20min. Since you haven't cited any specific error messages, it's not clear that your problem is necessarily related to the problem of the user above. Since you mentioned trying Chrome though, I can say that the latest version of Chrome (version 42) does not support the Java plugin. Although there is a way to re-enable it, this workaround is only meant to work until September 2015. Since other browsers do not restrict the plugin, I would first recommend trying another browser in lieu of Chrome version 42. Internet Explorer, Firefox and Safari should all be viable options. Although I have no trouble running the free version of BikeCAD on IE, Firefox and Safari on Windows Vista, Windows 7, Windows 8.1, several Mac OSs and Linux Ubuntu, I will admit that there are a lot more hoops to jump through with respect to the Java plugin than there used to be when I first started offering this free program years ago. I'm starting to feel that when people have to struggle to run the free version, I might be doing myself more harm than good by offering it. It would be unfortunate if your perception of BikeCAD Pro were negatively impacted by your troubles to run the free version. BikeCAD Pro suffers from none of the complications associated with the free version. recently bought a samsung laptop with windows 8.1 and can't get bikecad to run on it. Was using windows 7 on my old machine without any issues (besides lagginess because it was old as hell). But when trying to run the applet it freezes the browser to the point where I have to kill it with task manager. I've tried using firefox and explorer. The applet screen just stays blank all the time. I've tried waiting about 5 minutes or more, but it still looks stuck. I'm sorry I don't have an explanation for exactly what's going on. However, I have a bit more insight as I am now also having issues with Java 1.8.0_45. It's odd because initially, I had no trouble running the free version of BikeCAD on 1.8.0_45. It was crashing for Jan2 and he posted his Java console output. I compared Jan's output to the output on my own computer and couldn't detect a reason for Jan's problem. Jan and I were both running JRE version 1.8.0_45-b14 and things were working fine for me. It's only in retrospect that it seems important to point out the differences in the Java Plug-ins we were each using. Jan was using Java Plug-in 11.45.2.14. and I was using an older plug-in. While I think the Java plug-in is generally meant to be updated with each new update to the JRE, apparently, it doesn't always happen at the same time. In my case, my Java plug-in did eventually update to 11.45.2.14 and it was only then that I experienced the same issues as Jan and presumeably others. Although it is recommended that older JRE's be removed when the JRE is updated, I have been in the practice of keeping the old versions for trouble shooting purposes. The first thing I tried was using an older JRE (1.8.0_40). That didn't work any better. At this point, I'm thinking the issue is not with the JRE, it's with the plug-in (I'm still using Java plug-in 11.45.2.14). Next thing I tried was JRE 1.7.0_67. As luck would have it, this JRE paired with Java plug-in 11.45.2.14 works well. I have replicated this solution on both a PC running Windows 7 and a PC running Windows 8.1. I'm sorry that these circumstances are creating such a challenge to using the free version of BikeCAD. Rest assured, none of these issues exist in running BikeCAD Pro which is a stable and reliable standalone application. I'll try to fiddle around some more with those JRE versions some more while using the program on my old machine. About buying Pro version, I'm looking forward to it, but don't have enough cash yet. There's no option for buying it in parcels, is there? Thanks for your understanding. As for purchasing BikeCAD Pro in parcels, that is not currently an option. Depending on your situation, I may be able to provide a coupon for a slightly reduced price. Hello Brent, since the last java version i can`t use the web version, same problem as above. I try with all solution but not work. I hope someday find a solution. Sorry to hear that Nacho. I did get it working again as described here. Perhaps I will compile the next update using Java 1.8. I've done that in the past but there were a number of users who because of their operating systems were incapable of running the latest JRE. Until now, it has seemed like the best way to please everyone was to compile for the oldest JRE. That way the program would run on the oldest JRE as well as all newer ones. On a related note, using BikeCAD Pro is another way around these headaches. Be aware that the cost is a one time fee. All future updates are included at no extra charge. For the past month I am using a old version of Chrome with no problem until I started to use the last version just installed now and the heck i got this problem, then i used the IE7 which is the diffult for Win7 it was very slow but still i can use the free app, I think the Chrome is the problem because of the plugins and some of our application we use here in office are effected too. Hopefully the bikecad free app will update too. I am still looking forward to this app. Yes, unfortunately, Chrome version 42 does not support the Java plug-in. Since BikeCAD Pro is a standalone application, no plug-in is required. reading all the problems above is a bit daunting. i have downloaded bikecad and gone through all the steps of updating java, restarted my computer etc. searched and done setps to activate java. added both bikecad site url's to exceptions on java security. i still get activate java prompt when trying to open quick start on your site. ??? Did you try going to java.com then clicking "Do I have Java" and then "Verify my Java version" ? I will test it java.com if it works there it should work here. Could you include a screen capture of what you're seeing? It is common for browsers to prompt users to activate plug-ins before allowing them to run. However, usually all it takes to activate the plug-in is to click on the Activate link presented. Another locked out Chrome user. Do you have a target date for the non-Java version of the free program? Given the extensive work involved, your pricing of the full featured Pro version is certainly reasonable as it pertains to professional users, but forbidding for many enthusiasts. Have you given any thought to offering a third 'enthusist' standalone version (sans key Pro features) for a modest price of say $50 (a la QCAD). Its sales volume could overwhelm the erosion of Pro sales to frustrated enthusiasts. I can't be sure when I'll have the new non-Java applet based free version of BikeCAD ready. However, here's a screen capture of a sample bike in BikeCAD, and below it, that same sample bike in the non-Java applet based version of BikeCAD. As you can see, there are still a few things missing in the new free version, but things are coming along. Thanks for the suggestion of an additional standalone version of BikeCAD. I have not yet prepared such an option. However, depending on an individual's situation, I will sometimes offer a discount on the cost of BikeCAD Pro. Feel free to e-mail me about that if interested. I am running OSX Yosemite and cannot seem to configure my secruity preferences, so I can run BikeCad. I have done both steps outlined here, but when I open BikeCad on Safari, Chrome and Firefox, I am getting the same issue.. There all telling me that I cant run the application due to security preferences..
Is there anything else I can try or do? Do I need to reset the computer before opening a web browser? Any help would be much appreciated, as I am super keen to start playing with this! The current Java plugin has two choices for security levels: High and Very high. You must choose High. Setting it to Very high would give you a message such as what you're seeing. Also, be aware that the Chrome browser no longer supports the Java plugin so you will have to use Firefox or Safari, both of which should work. I also recommend giving the applet a few minutes to load as several people who have posted here claiming it didn't work for them later realized that it did work after giving it more time. Nope. the free versions doesn't work on Windows 10 - Chrome, Opera or Explorer. Have latest Java - enabled it, lowered security from very high to high, listed this site in exceptions to enable java... and also tried waiting an hour or so. the screen just stays blank. I'm sorry to hear you're having trouble. It sounds like you've done everything correctly. Although, Chrome does not support the Java plugin so one should not expect it run on that. Trying to use BikeCAD on multipule computers unfortunatly doesnt work on windows 7,8,10. Used IE, Firefox, chrome, downloaded new Java, added http://www.bikecad.ca and http://.bikecad.ca to Site list, put risk to high,......waited.......aaaannnnd nothing. screens stays blank or tells me "Application is Blocked" "untrusted application". I'm definitely looking forward to getting the new free version of BikeCAD out. Until then, I can assure you that the current free version does still work on Windows 7, 8, and 10. As I stated in the comment before yours, Chrome no longer supports the Java plugin, so there's no use in trying that. 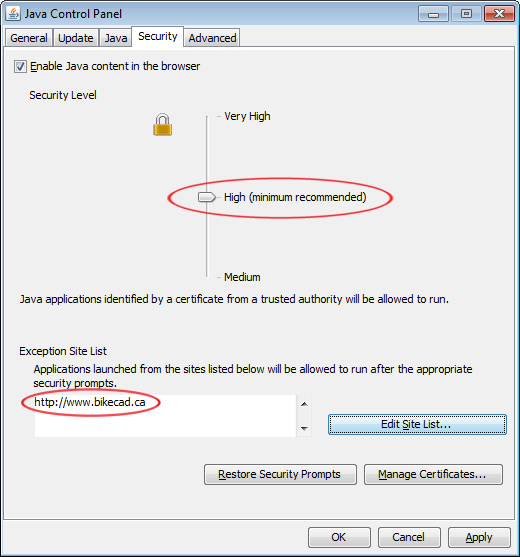 The current Java plugin has two choices for security levels: High and Very high. You must choose High. I'm still having trouble with the same issue. I tried Firefox and it fails with Securiy issue. Even after I added the website to the exception list. I can get it to work in any browser. Very frustrating!